We’re big music lovers here at Left Bank (obviously), and we’re 100% convinced that there’s no better way to listen to music than on a record player. Whether we’re dropping the needle on our favorite record (it’s been Blondie for me lately), it sounds…well, like music should sound. So if you want to a) listen to music the way it should be listened to and b) win free stuff, sign up to our mailing list to enter the giveaway. The only hitch is that you’ve gotta be 18 years or older, and US-based to win it, because of #rules and #laws and stuff. The winner will be announced in a week 😉 good luck. 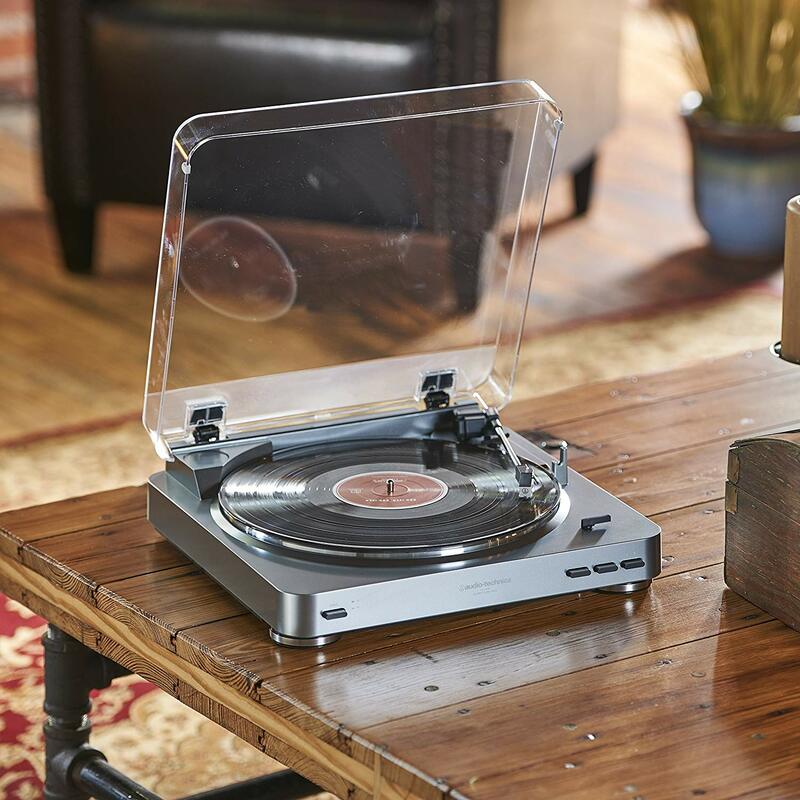 Left Bank x Turntable Sweepstakes (the “Sweepstakes”) entry period commences at 12:00 p.m. Eastern Daylight Time on January 25, 2019, and ends at 11:59 a.m. Eastern Daylight Time on January 31, 2019 (the “Sweepstakes Entry Period”). The Sweepstakes is sponsored by Left Bank Media ( the “Sponsor”). One turntable giveaway will be offered for the entire entry period. The turntable company has no association with Left Bank Magazine, Left Bank Media, or any of its affiliates. This Sweepstakes is open to any legal resident of the 50 United States, and the District of Columbia, 18 years or older as of date of entry. Entrants must sign up for Left Bank Magazine email list to enter for a chance to win. Employees of the Sponsor; any promotional companies or advertising agencies participating in the Sweepstakes and employees of their respective subsidiaries and affiliates; any persons involved in the creation, development, or implementation of this Sweepstakes; and any other persons or entities directly associated with this Sweepstakes and any members of their immediate families or households are ineligible to participate. Entries for the Sweepstakes drawing must be received prior to the expiration of the Sweepstakes Entry Period. This Sweepstakes is void in Puerto Rico and the U.S. Virgin Islands and wherever prohibited or restricted by law, and is subject to all federal, state, and local laws and regulations. By submitting a comment and entering the sweepstakes, entrants agree to abide by these Official Rules and all applicable federal, state, and local laws and regulations that govern sweepstakes. One (1) Grand Prize winner selected in a random drawing from all eligible entries received during the Sweepstakes Entry Period prior to 11:59 a.m. on Jan 31, 2019, will receive one (1) turntable. The turntable company has no association with Left Bank Magazine, Left Bank Media, or any of its affiliates. Actual retail value may vary. The Grand Prize is not transferable or assignable, or redeemable for cash or any other consideration, and no substitutions will be allowed except by Sponsor, which reserves the right to substitute prizes of equal or greater value or nature if advertised prize is not available to the extent practicable. Grand Prize includes the turntable described above only. All expenses not specifically provided herein are solely the responsibility of the winners. The Grand Prize winner is responsible for compliance with all applicable federal, state, and/or local laws and regulations, including, without limitation, the payment of all applicable taxes. You may enter the Sweepstakes by accessing the entry screen at https://us11.list-manage.com/subscribe?u=a70e08b8336fd06f16da77423&id=4a24c668b0 and following the instructions set forth on the entry page in accordance with the specification set forth therein, and transmitting the information to the Sponsor before 11:59 a.m. Eastern Daylight Time on Jan 31, 2019. Limit one entry per person/email address. Entries must comply with file specifications on entry page and must be in English. Entries must be entrant’s own original work and owned solely and exclusively by entrant, have not won a previous prize or award and have not been previously published, must not infringe on, misappropriate or otherwise violate any third-party rights (including but not limited to copyright, trademark, rights of publicity or privacy or any other proprietary right), and must be deemed suitable by Sponsor. Entrant agrees to indemnify, defend and hold harmless Sponsor, and each of their respective affiliates, and their respective shareholders, members, owners, officers, directors, employees and agents from any losses, damages, or expenses arising from or in connection with infringement, misappropriation or violation of any third party rights. Entries deemed lewd or offensive may be disqualified, in Sponsor’s sole discretion. Entries that comply with format and suitability specifications may be acknowledged by e-mail, but remain subject to full eligibility determinations at the sole discretion of Sponsor. Normal Internet access and usage charges imposed by your online carrier apply. Incomplete or late entries will be disqualified. An entry will be deemed to have been made by the “authorized account holder” of the email address utilized at the time the entry is made. For purposes herein, the “authorized account holder” refers to the person assigned to an email address by an Internet access provider, online service provider, or other organization responsible for assigning email addresses. If an entrant is determined to have sent more than one entry, that entrant will be disqualified. All entries will become the property of Sponsor and will not be returned. Sponsor is not responsible for transmission and/or computer error. The potential winners of the Sweepstakes will be selected in one drawing: One drawing on or about Feb 1st, 2019, from all eligible entries received during the Sweepstakes Entry Period. The Grand Prize winners selected in the drawing will be notified via email on or about Feb 1st, 2019, using the contact information provided on the applicable winner’s entry form. Each entrant is responsible for the accuracy of the information included in his/her entry. The Grand Prize drawing will be conducted by Sponsor. The Grand Prize drawing shall be final and conclusive. The odds of winning the Grand Prize will be determined by the actual number of eligible entries received. The turntable company has no association with Left Bank Magazine, Left Bank Media, or any of its affiliates. By entering this Sweepstakes, each entrant hereby voluntarily and irrevocably releases, holds harmless and agrees not to institute any claim against Sponsor, any of their respective affiliates, and their respective officers, directors, shareholders, employees and agents from any losses, damages, or expenses from any and all injuries, losses or damages of any kind arising from or in connection with, either directly or indirectly, (1) the awarding, acceptance, receipt, possession, use and/or misuse of the prize awarded herein; and/or (2) participation in the Sweepstakes or any prize related activities. THE NEW YORK COURTS (STATE AND FEDERAL) SHALL HAVE SOLE JURISDICTION OF ANY CONTROVERSIES REGARDING THE SWEEPSTAKES AND THE LAWS OF THE STATE OFNEW YORK, WITHOUT REGARD TO CONFLICTS OF LAWS PRINCIPLES, SHALL GOVERN THE SWEEPSTAKES. ENTRANTS WAIVE ANY AND ALL OBJECTIONS TO JURISDICTION AND VENUE IN THESE COURTS AND HEREBY SUBMIT TO THE JURISDICTION OF THOSE COURTS. To obtain the winner’s name, send a self-addressed, stamped envelope by Feb 10 2019 to: Left Bank Magazine, 7105 3rd Ave, Suite 153, Brooklyn, NY 11209, Attention: “Left Bank Turntable Sweepstakes” Winner’s Name. Left Bank Magazine, 7105 3rd Ave, Suite 153, Brooklyn, NY 11209, Attention: “Left Bank Turntable Sweepstakes” Winner’s Name.